Find out which woods are a cut above the rest. A cutting board acts at any given moment as a chopping block, food preparation surface, or serving station—sometimes all three. So it’s essential that this can’t-live-without kitchen accessory be made of a durable material. Pro chefs swear by wood because it’s more impact resistant and sanitary than plastic, gentler on knife blades than bamboo, and cheaper than marble or granite. But not all types of wood are superior options. When buying a cutting board for your home kitchen, know that certain wood species handle the chore of chopping better than others. Keep reading for a detailed comparison of the best wood for cutting board and butcher block products so that you’re sure to snag a cutting surface built to last. Janka hardness rating: The higher the hardness rating of a wood (measured in pounds-force or lbf), the harder and more resistant it is to scratches, dents, or dings from knives. Opt for hardwoods like maple over softwoods like pine; the former usually have a higher hardness rating and are less damage-prone than lower-rated softwoods. Porosity: Choose closed-grain woods (pores invisible to the naked eye) to keep liquid or bacteria from entering the cutting surface and cause mold growth, wood warping, or stains. The smaller the pores, the better. Open-grained woods (pores visible) such as oak and ash are a poor choice because they soak up moisture like a sponge and quickly become a breeding ground for bacteria. Toxicity: Stick to woods that produce edible fruits, nuts, leaves, or sap; these are considered to be food-safe. Exotic woods like Purpleheart, while attractive, should be avoided as they often contain toxins that may leach out of the wood and into food placed on the cutting surface. Conditioning: Food-grade mineral oil should be applied to wood cutting boards and butcher blocks to suppress wood’s natural tendency to shrink and warp or split as surrounding humidity decreases. 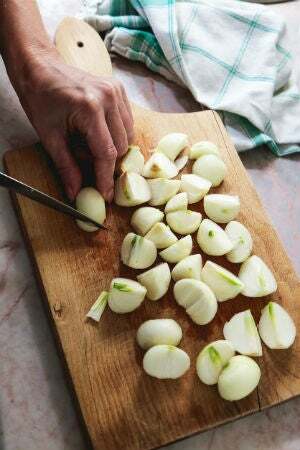 Typically, you should condition quarterly after cleaning wooden cutting boards, but some woods shrink more than others, so you’d need to oil these woods more frequently. Factoring in the above criteria, we’ve compiled a shortlist of the best woods for a cutting board. See how they stack up below. Both soft and hard maple make for excellent cutting surfaces. But hard maple (1,450 lbf on the Janka hardness scale) is the industry standard among cutting board makers: It’s more scratch- and impact-resistant than beech, teak, or walnut but not so hard that it will dull your knives. This food-safe, closed-grained hardwood has smaller pores than even the alternatives listed below, making it superior to those in blocking bacteria, moisture, and stains. But when it does form stains, they’re hard to hide on its off-white to amber-yellow surface. Maple cutting boards and butcher blocks also cost more than beech ($20 to $150) and shrink more than teak and walnut as humidity decreases, so condition maple cutting surfaces monthly to bimonthly. Measuring 1,300 lbf on the hardness scale, this food-safe, closed-grained hardwood is non-damaging to knives and offers stellar scratch and impact resistance outdone only by hard maple. Its small pores make it nearly as effective as maple (and more effective than teak or walnut) at warding off bacteria, moisture, and stains. However, its cream to pink or brown color more easily shows stains than either teak or walnut. These cutting surfaces are generally the cheapest ($15 to $100), but they shrink more than any of the three other woods, so condition your cutting board monthly. Boasting a hardness rating of 1,070 lbf, teak holds up better to scratches and impacts than walnut but less so than beech or maple. But as a tropical closed-grained hardwood, teak costs the most ($25 to $500) and has a high silica content, so frequently cutting on a teak cutting surface will dull your knife blade. Teak shrinks less than any of the other three wood options for cutting boards, so you can get by conditioning it quarterly to biannually. But its large pores make it more vulnerable to bacteria, moisture, and stains than walnut, maple, or beech. That said, the orange-brown to dark brown hue of the food-safe wood masks stains better than maple, but not as well as walnut. The softest of the closed-grained hardwoods mentioned, walnut is unlikely to dull knife blades, but it more readily scratches or dents than the other woods given its lower hardness rating of 1,010 lbf. The medium to large pores of this food-safe wood offer more resistance to bacteria and moisture than teak but less so than maple or beech. It also shrinks less than maple or beech, so conditioning will only be a bi-monthly to quarterly undertaking. What’s more, the rich chocolate-colored hue of the wood masks everyday stains and lends countertops a high-end look that is matched by a higher price tag of $20 to $200. 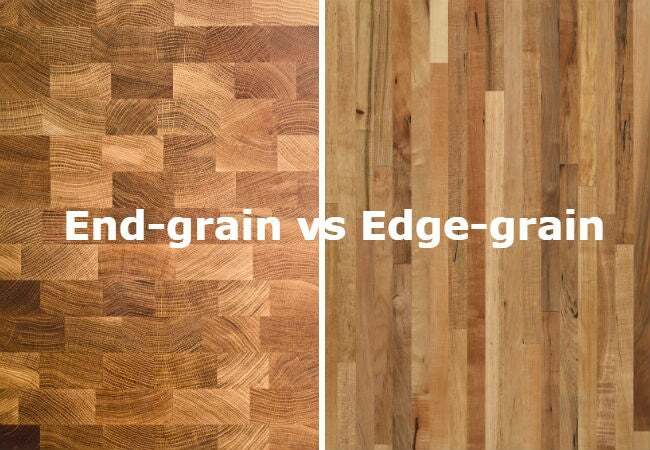 Within the category of wooden cutting boards come, you’ll find two design varieties: end-grain and edge-grain. These cuts aren’t just for show; each pattern boasts a different level of durability. • Four to fifteen times more expensive than edge-grain surfaces, end-grain cutting boards and butcher blocks are made by fusing together cut wooden boards so that the short ends of the boards form a level surface that faces up. The cutting surface looks like a checkerboard comprising the ends of a 2×4. 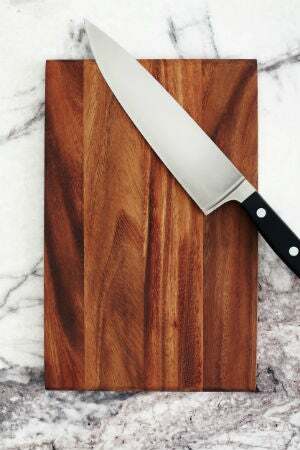 Because the short ends of wooden boards are more fibrous and have an open wood-cell structure, the cutting surface of an end-grain board is softer, more gentle on your knife, and also gives your knife a better grip during cutting. Minor dents are usually only temporary as the open wood-cell structure of the cutting surface allows it to self-heal i.e., spring back into shape after minor impressions have been formed. • Edge-grain cutting surfaces are made by fusing cut wooden boards so that the side edges of the boards form a level surface that faces up. The pattern on the surface resembles a series of long, lean strips like the sides of a 2×4. While these cutting boards and butcher blocks are heavier and hence offer more stability while cutting than end-grain surfaces, they’re significantly cheaper than end-grain boards because of their simpler construction. 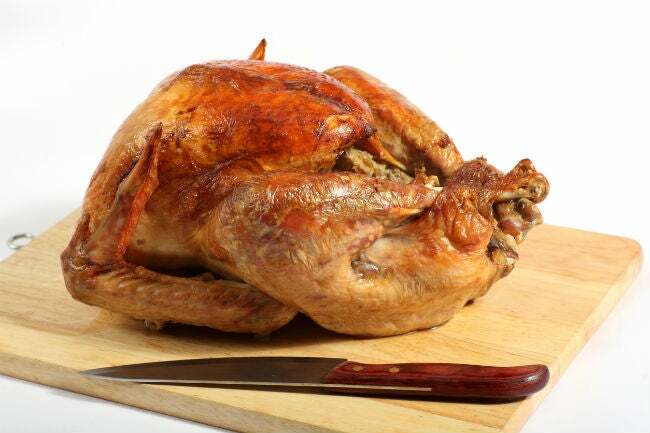 However, the cutting surface is harder and has less give, so is more likely to dull your knives over time. It also has less ability to self-heal, so it’s more likely to show cutting marks.